Photographing a funeral may sound unusual but deaths, like births, are key moments in any family’s history. If done properly, photos of a funeral and wake can serve as a fitting memorial, bringing together happy and sad memories. Back in 2001 I bought FuneralPhotography.com. In a way it is an unfinished project, still sat there in stasis. I won’t say it has lay there dormant and totally unused but I’m still waiting for the world to become a little more open minded to the whole idea. Four years ago I went to my Grandad’s funeral and left my camera at home. I wish I had taken it. I had organised the funeral and understandably had other things on my mind. Yet as the funereal morning came to its climax and my brother and I lowered the casket into the ground, I instinctively reached for my camera. It wasn’t there. 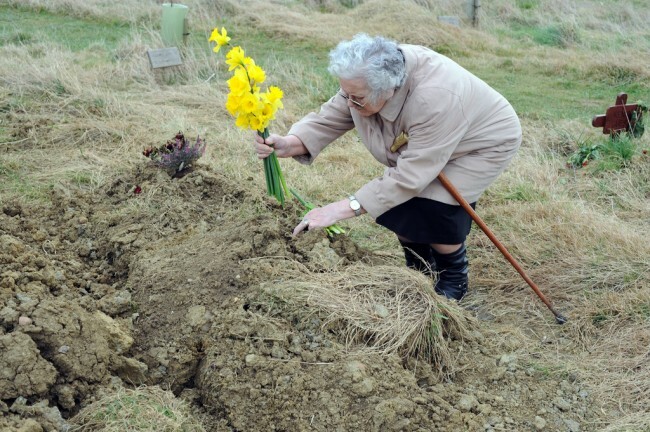 The scene was beautiful, the green burial site was a field deep in the British countryside. At the foot of the grave next to my Italian Grandmother, a violinist played graceful tunes as the family took it in turns to throw single red roses onto the coffin. I looked across at my brother as he looked up at me and we both smiled. My Grandad would of loved it. He always thought of himself as ‘the Don’. I want to remember that moment forever. A picture would have helped. Then there were those members of the family spread out over the world that could not be there. A photo could have given them closure. Anyway, I was inspired and saw all the good reasons for capturing images at funerals. Other than weddings there is no other time you get so many of one family in one place. Probably more so. This is a great coming together and unlike a wedding – where everyone dresses up and tells you how great their life is and how much money they are earning – people seem real at funerals. Sincere, attentive, keener to listen to those around them. Suddenly humbled by loss and brought back to earth with the realisation that our time here is limited. Perhaps we need to be reminded of these things. And funerals are not just sad; when families and friends get together to remember loved ones, fond memories are usually order of the day, and laughter not uncommon. Funerals, in a strange way, are more often celebrations of life than maudlin recollections of death. I am guessing that funeral photography hasn’t taken off because there isn’t really any money in it. Good. It may surprise you to hear I am not interested in it to make money. The last thing I want to see in amongst the hundreds of bolt on services that undertakers have leaflets for is some flier for a local photographer advertising ‘weddings and funeral packages to cater for all your pictorial needs’. I think we are ripped off blind as it is. Prayed apon in a time of grief where we are told the more you spend the more you obviously love the departed. All funerals should be free. You would think that after a life of work in order to keep the cogs of society turning the least the state could do is pay for you to be put in a hole. So, let’s say you have decided that the normal taboos around death and dying won’t get in the way of a moment of history being documented. Or maybe you have been asked to take photos at a funeral. How should you go about photographing a funeral? I have had a few emails from people wanting to know how to take pictures without upsetting the more sensitive of attendees. Obviously being a member of the family helps. If your not, then make sure people at the funeral know what you’re doing, why you are there before you pull out a camera. Then just be discreet. Not so long ago I was asked to document the funeral of a friend of mine. Although close to the departed I hardly knew any of the people that were going to be there. Because of the time of the year the Dafodils were a theme throughout the service and the family had said that if it wasn’t for the flowers they would love the pictures to be in black and white. I don’t normally do selective colouring but as the order of service, the church, the digital projector and the grave side all featured the daffodil I figured it might work. Regarding equipment I think a full blown 35mm digital slr is out of the question unless you are going to be loitering in the trees like the paparazzi. I have a Leica M6, a super quiet camera perfect for candid reportage, but on this occasion I chose to use a Ricoh GRD compact digital. I thought that with it’s 28mm lens and a big memory card, i could shoot from the hip so as not to draw attention to myself and keep on shooting till the memory card was full. This meant that i could get intimate with what was going on and not ruin the service or get in the way of people’s emotions. That said, the camera got in the way of my emotions and acted as a filter of sorts. It was not until I was editing the pictures at home later that night that I broke down and shed a tear for my friend. Having the camera made me an observer and not a participator. So, the funeral photography website: it’s in a partially made state and if it creates a presence and introduces the idea that documenting the passing of a life is a ‘good’ thing, all the better. If someone finds it and asks, i will take pictures. If they are happy with the images on a CD, then I won’t charge, just the costs to get there and if it is down the road then not even that. I bought the domain shortly after covering the funeral of a minor celebrity for a local newspaper in Northamptonshire. I thought that as people’s perceptions of death and dying changed so too does our approach to documenting this often overlooked and ultimate moment in our life. Why are the only funeral photographs we see taken by the press covering the passing of royalty and the rich? What about documenting the average everyday member of the general public? Are we all not the same in death? Thank you for your site and article. A friend of mine lost a baby to heart failure almost a year ago. The funeral was remarkably scenic and peaceful. A hundred people stood graveside for a tiny baby in the pitter patter rain. Last week my friend and I were reviewing details and she can’t recall stretches of days let alone the details of the event. I so terribly wish I had the forethought to photograph the event. Which has lead me to think there is a “market”. I am in 100% agreement the grieving should not be prayed upon however the photos of the event are priceless, as you said, just like a wedding or birth. Personally, I hired a photographer for the birth of my son. It has been the best investment I have made in years…and even then I was only charged a $100 for several hours of the photographers time. I want to provide such memorable services. What were your thoughts/ideas as far as “fair” marketing practices? I am a bit clueless as how to go about it without offending many. I have soft heart for people in distress. How would you go about contacting people in such a state without directly involving a funeral home, which of course would want part of the fee? My thought is to only charge what truly would be my expense; gas, childcare, etc. Thank you in advance for your time and thoughts. Best wishes. I found your website after seeking advise on how to go about discreetly taking a few photos at my brother’s memorial service coming up April 19, 2009. Your compassion is heart warming. May I ask, what state are you located in? I’m in California. I am based in England. I have been thinking about doing funeral photography for some time now but worried that people will see it as a way of making money off of the death of another person. It makes me sad that more people can’t appreciate the funeral event as a monumental part of that person’s life and passing, and therefore something to be documented. Any photos obtained during that event should be cherished. That’s my point. I think funeral services take advantage of those in mourning already. Why add to the immorality of taking advantage of someone in grief. Be reasonable, that’s all I say. I love the photos of Josh’s funeral! So beautiful and well done. My greatest wish is that we all could return to the mentality of the Victorian Era where death is mourned openly. I have photographed many loved ones at the funeral home, including my late husband. If everyone could know the comfort those photos bring, perhaps this type photography would become more acceptable. Thanks for the comment. I do think we had a better outlook on death then. And I hope we do again.